"Do you know if you are going to heaven?" Shortly after being appointed the first Director of Faith-Based and Community Initiatives—the "faith czar"—John J. DiIulio Jr. was asked this question. Suddenly DiIulio, a Catholic Democrat who pioneered programs for inner-city children, was acutely aware that he was no longer a private citizen who might have humored the television evangelist standing before him. Now he was, as he recalls in his introduction—"responsible for assisting the president in faithfully upholding the Constitution . . . and faithfully acting in the public interest without regard to religious identities." 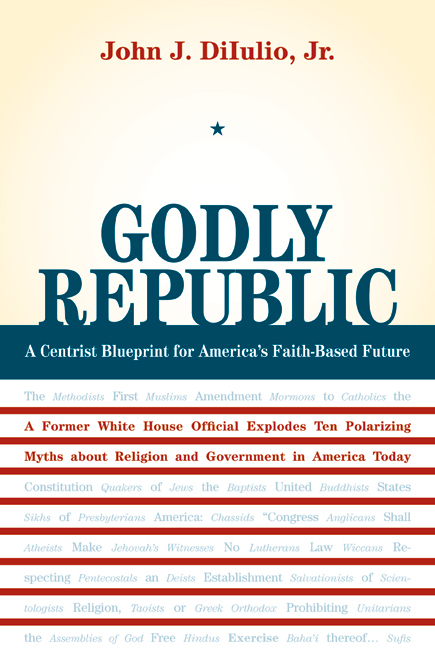 Using his brief tenure in the George W. Bush administration as a springboard, this lively, informative, and entertaining book leaps into the ongoing debate over whether as a nation America is Christian or secular and to what degree church-state separation is compelled by the Constitution. Avoiding political pieties, DiIulio makes an impassioned case for a middle way. Written by a leading political scholar, Godly Republic offers a fast-paced, faith-inspired, and fact-based approach to enhancing America's civic future for one and all. John J. DiIulio Jr. is Professor of Political Science at the University of Pennsylvania and the first White House “faith czar” appointed in George W. Bush’s first term.